▲ Figure 1: Plot of polaritons' energy dispersion vs momentum in a semiconductor microcavity, seen from above (left) and the side (right). Minimal energy locations, called valleys, are shown with white crosses. ▲ Figure 2: Model of valleys with different polarizations. The model uses vectors (arrows) and colors (from yellow to blue) to show opposite polarizations on different valleys (white crosses). 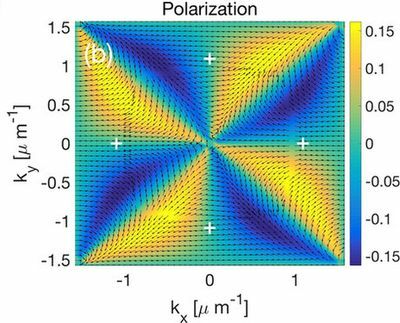 The opposite polarizations (arrow direction) can be, in principle, excited selectively by a polarized laser. For further information or to request media assistance, please contact: Mr. Shi Bo Shim, Head of Department of Communications, Institute for Basic Science (+82-42-878-8189, sibo@ibs.re.kr); Ms. Carol Kim, Global Officer, Department of Communications, Institute for Basic Science (+82-42-878-8133, clitie620@ibs.re.kr); or Dr. Letizia Diamante, Science Writer and Visual Producer (+82-42-878-8260, letizia@ibs.re.kr).